Finally sold the 05 and picked up the 2008 last weekend. The parts have been trickling in all week. All I am waiting on now is a tall seat for it. I was able to get it setup the way I like it before the first ride. It has been really nasty here in CenTex, so I worked it over and added a few pieces. Still looks like a stocker, though. Motor- out of frame. All welds were complete, but motor was torqued in the frame and had huge pressure on the mounts on the upper frame. Front end- good grease on steering head, but no torque. Airbox was sealed really well from factory. Overall, about the same as my 03 and 05, but I really wish they would put the wheels together better. New rotors are cool, but the front brake even after bleeding feels mushy. Rear brake was well bled. No nasty cosmoline on the rotors. Airbox is still small, but you get used to it. Ergos are really low and the gas tank is flattened down a bunch compared to my 05. I will update with ride report later, if this rain and wet ever stops. I have my fingers crossed that the suspension is workable. I would really hate to throw several bills at the forks and shock before it has 5 hours on it. 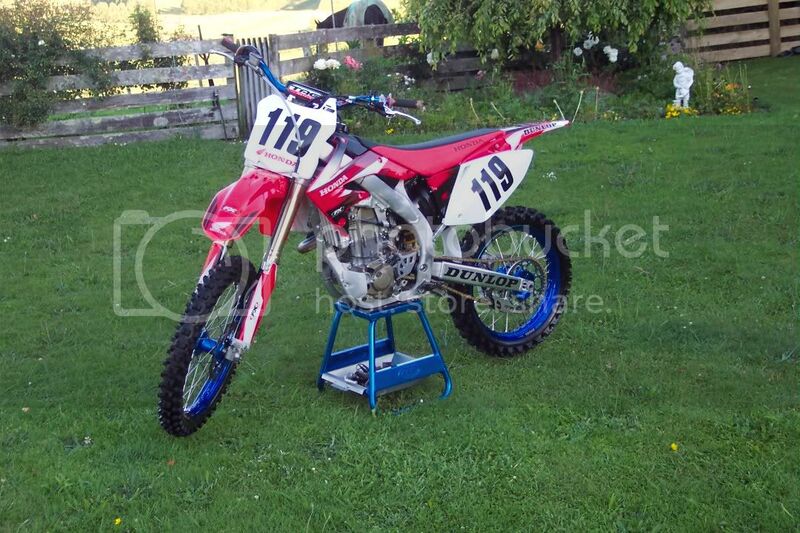 Now thats how you do up a bike, don't give it a chance to make a bad impression with wimpy stock parts. Looks good, can't wait for the ride report. BTW, get that bad boy some numbers, it can't go out all nekked like that. Numbers are sitting in the top of the toolbox. Has been too cold to put them on right and I haven't felt like breaking out the heat gun. Will happen this weekend. Cool, you could always take them inside, thats what I always do. Missed im my first post about the new front number plate, they finally changed their goofy design that had them zip tied to the forks. Never liked those. I never really can get them angled right on the CRF panels when they are off the bike. It was easier on my KX's, but the CRF is angled so funny that to get them really right you need them on the bike. I have my fingers crossed that the suspension is workable. I would really hate to throw several bills at the forks and shock before it has 5 hours on it. I'd be willing to bet you get your suspension done fairly quickly. rbm picked up an '08 a couple months back. Here it is before the first ride. I think he got two rides on it before spending the bucks. Once you've had the good suspension, it seems difficult to push as hard on stock. Quick disconnect fuel line? Tell me more. That black/white one looks really good, I'm a sucker for black rims. Wow i dont want to be a post whore but that bike is amazing. Thats the look everyone wants, at least I want. From Tucker Rocky. Made by Motion Pro. Is a 5/16" quick disconnect so that you don't have to pull the hose off of the petcock every time. They have been using them on roadrace bikes for years with no problems. I had one on my 03 and 05. It makes taking the tank off so much easier. Just do not get the one that has the fuel shutoff in it. I think it might interfere with flow. I have had excellent suspension on the last two bikes. This one will probably get done ASAP. Bike looks good Lawdog, looking forward to hearing your first ride impression. Nice new ride...nothing like rolling a new bike around in the garage. grrrr im jealous, im trying to sell my yz250f asap and prolly getting myself a crf250r... tell me how the 450 is once u get a chance to use and abuse! oh man! Both bikes look GREAT! I can't wait to hear the ride reports. Jedi, any chance of coaxing rbm to post a ride report? oh man... this is Motoporn at its best! My 08 CRF450 had Blue grease in the links and white in the head set. I Never used the stock rims or disks so cant compair breaks but mine were sweet. All bolts were sweet. Stock chain didnt last past the 3rd ride. I saw you put your moto minder on the side of your frame. mine managed to fit on top of the CDI unit and is easy to see. Still waiting on radiator braces. Tag CR double high bend is a must or it feels like you are going over the bars. I did find the bottom end and mid range to be rich so leand it off a tad with the provided jets. Next will be re valving the shocks. Had some good crashes on it to bent a few things. Sub Frame, Clamps for the bars, broken leavers list gose on. But your pushing hard enough if you dont fall off lol. Nice prep, LD! Good catch on the spokes. Probably not. He doesn't spend much leisure time in front of his computer. Stays hooked up solid with his own business and all. I'd like to add that I was the first one to ride it, though. He unloaded it from the trailer and I just jumped on it and rode it around the pits so I could say I was first. That was back in October but he's done a TON of mods since then. He did say it's the sweetest bike he's ever ridden. Batman rode it hard so maybe we can hear from him. When I worked at the Honda shop I had a guy working for me that would buy a new bike every year. He would buy them still in the crate because everything had to be disassembled and greased/tightened. Seems like most of the dealers are using apprentice mechanics for their new bike assembly. BTW NICE NEW BIKE !!!!!!!!!!! I need a new bike. 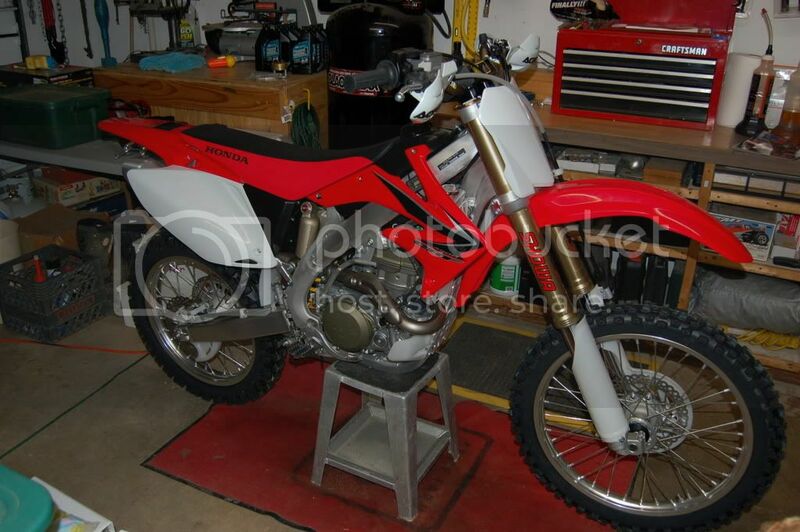 Anybody looking to sponser a soon-2-be 40+ semi-retired "B" class MX'er? Good report James. Shows what you can find out about a new scoot when you check carefully. Hope the first ride is/was great for you. I look forward to a report on any suspension mods too. Hey, nice ride looks sweet as!! do you have any other pics of it and how does it run? what brand rims and hubs are they and what do they value at? What brand braking rotors are they and what do they value at? Any way it looks sick and the blue rims suit, but i reckon a one industries no fear/sobe/samsung graphics kit would have gone well with the blue!